Craterellus tubaeformis is a small chanterelle with a brown cap, well developed false gills that often develop grayish shades, and a yellow stem with a waxy surface. It is usually found in moss, primarily in the cold conifer bogs of northern and montane North America--and it is not uncommon to find it fruiting from very well decayed, moss-covered logs. As the species is currently defined, it is apparently circumboreal and montane, so that collections from northern North America represent, theoretically, the same species as those from northern and montane Europe. This may, or may not, actually be the case; see the discussion below if you care. On the West Coast of North America a very similar, unnamed species, Craterellus species 02, can be found from northern California to Alaska. 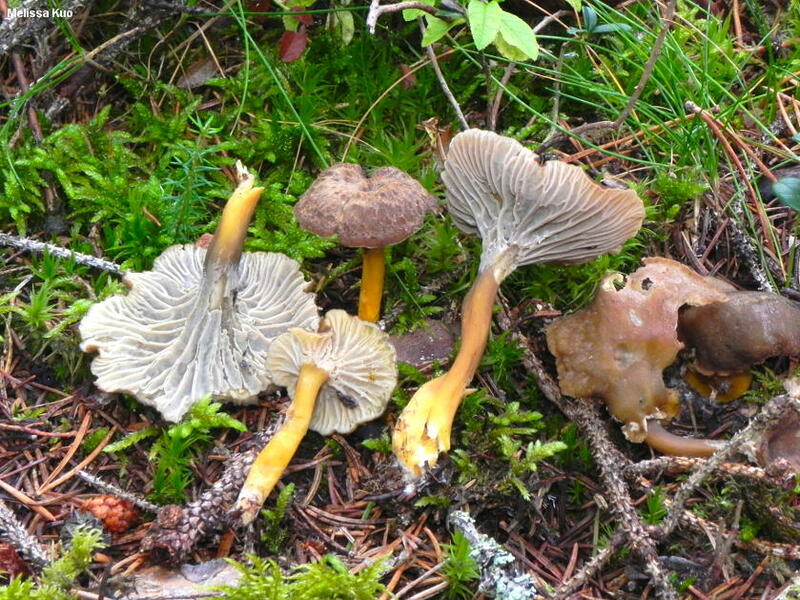 In eastern North America several putative species have been separated on the basis of minor morphological differences, including: Cantharellus sphaerosporus, which has nearly round spores but is otherwise nearly identical; Craterellus pallidipes, with a long, pale stem; and Craterellus flavobrunneus, with a cap that begins as yellow but matures to dark brown. And there is a centuries-long debate about whether Cantharellus/Craterellus infundibuliformis is a separate species; see the discussion below, again, if you care. Ecology: Mycorrhizal with conifers; growing alone, gregariously, or in loose clusters in moss or on well-decayed, moss-covered logs in conifer bogs; northern and montane North America (also northern and montane Europe); fall. The illustrated and described collections are from Michigan, Québec, and northern Italy. Cap: 2-7 cm wide; more or less convex at first; soon becoming vase-shaped and eventually becoming perforated in the center; with a wavy and irregular margin when mature; bald; sticky or waxy when fresh; dark yellowish brown to blackish brown, fading to grayish brown or grayish with age; colors sometimes faintly streaked in radial patterns. 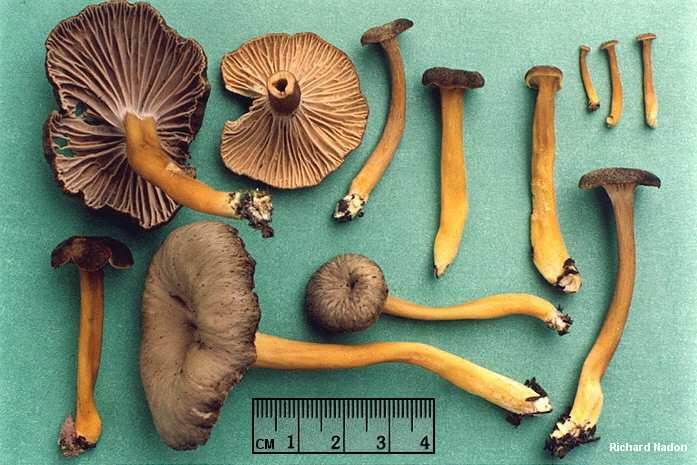 Undersurface: Running down the stem; when young with ridges and folds; with age developing well developed false gills that fork frequently and have cross-veins; yellowish to grayish or brownish--or occasionally faintly lilac. Stem: 3-9 cm long; 3-8 mm thick; more or less equal; becoming hollow; bald, with a waxy feel; usually orange to orangish yellow when young, becoming dull yellow, brownish, or orangish; basal mycelium whitish to pale yellow. Flesh: Insubstantial; brownish to yellowish. Odor and Taste: Taste not distinctive; odor not distinctive or slightly fragrant. 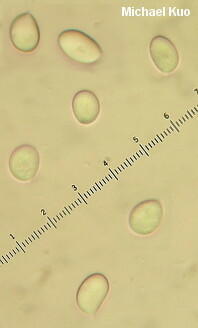 Microscopic Features: Spores 9-11 x 6-8 µ; ellipsoid; smooth; hyaline in KOH, with minutely granular homogeneous contents. Basidia 4-sterigmate; 50-65 µ long. Elements of upper surface cylindric; 2.5-10 µ wide; septate; hyaline to brownish or brown; smooth; with clamp connections. REFERENCES: (Fries, 1821) Quélet, 1888 (Saccardo, 1887; Corner, 1966; Smith, 1968; Bigelow, 1978; Petersen, 1979; Smith, Smith & Weber, 1981; Weber & Smith, 1985; Breitenbach & Kränzlin, 1986; Phillips, 1991/2005; Lincoff, 1992; Persson, 1997; Barron, 1999; Dahlman et al., 2000; Redhead et al., 2002; Roody, 2003; McNeil, 2006; Miller & Miller, 2006; Kuo, 2007; Guo-ying et al., 2011; Kuo & Methven, 2014.) Herb. Kuo 09039404, 09070102, 10111405. Cantharellus tubaeformis is a synonym. 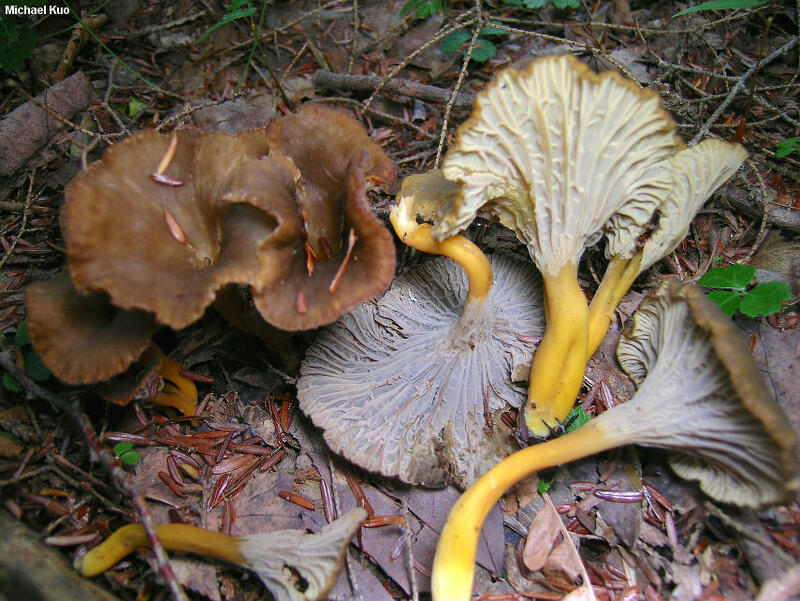 "Cantharellus tubiformis" and "Craterellus tubiformis" represent an error in spelling; Redhead and collaborators (2002) point out that "tubaeformis should not be changed to tubiformis . . . because 'tuba' refers to a trumpet shape and tubus to a cylindrical tube." Two molecular studies (Dahlman and collaborators, 2000 and Guo-ying and collaborators, 2011) help to inform the contemporary concept of Craterellus tubaeformis. The Dahlman study, which is now 15 years old, looked at the large subunit of RNA, known as the LSU gene. In the years since the Dahlman study it has become clear to practitioners of mycological molecular systematics that LSU is often useful for determining large taxonomic units and groupings (families, genera, species groups)--but is not generally reliable for the determination of individual species. Thus, some of the taxonomic changes proposed by the Dahlman paper--those involving genera and species groups--are likely to remain valid by today's standards. But some of the proposed changes that involve determination of species may need to be (and have been, in part) revisited by studies that use species-informative gene sequences. Dahlman and collaborators put to rest the idea that Craterellus tubaeformis belongs in the genus Cantharellus; LSU results were quite clear about this, showing a clear and well-supported division between Cantharellus and Craterellus, with tubaeformis positioned smack-dab in the thick of the Craterellus species. Other taxa confirmed by LSU sequences as belonging in Craterellus included Craterellus cornucopioides, Craterellus fallax, Craterellus odoratus, Craterellus sinuosus, Craterellus lutescens, Craterellus ignicolor, and Craterellus infundibuliformis. However, Dahlman and collaborators also proposed several taxonomic changes for species based on the fact that they grouped together in the LSU phylogeny. One of these proposals, that Craterellus cornucopioides, Craterellus fallax, and Craterellus konradii are the same species, was partially overturned by Matheny and collaborators (2010), who used the species-informative ITS (internally transcribed spacer) gene to support a clear separation between Craterellus cornucopioides of Europe and eastern North America's Craterellus fallax. 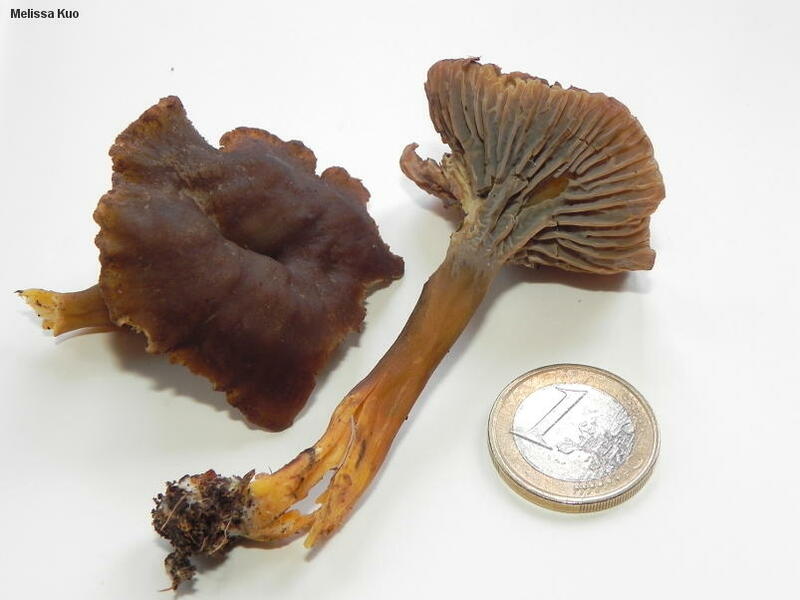 The Matheny paper did not address the question of the yellow Craterellus konradii. Another potentially faulty conclusion from the Dahlman paper is the proposal that Craterellus infundibuliformis and Craterellus tubaeformis represent the same species; further study with a species-informative gene should be done in order to re-evaluate this idea. The centuries-old debate about how these taxa should be separated (spore print color? color of basal mycelium? etc.) is thoroughly summarized and explored for several pages in Petersen (1979), before he concludes he "can offer no taxonomic solution to the problem of character reticula in this complex." Although species groupings in the Dahlman LSU phylogeny should not, by today's standards, necessarily indicate species sameness, separation on the LSU phylogram is likely to be more reliable. In other words, if LSU shows entities as clearly separated, then they are likely to be clearly separated with species-informative genes, too, since LSU demonstrates larger-scale separations. This was the case for the North American West Coast's version of "Craterellus tubaeformis," which was clearly separated from European and eastern North American versions. Thus the West-Coast tubaeformis is likely to be a separate species (as-yet unnamed, which I've treated as Craterellus species 02). A subsequent study of the tubaeformis group by Guo-ying and collaborators (2011) used ITS, rather than LSU, and upheld the idea that the West-Coast North American and European species are different--but discovered a complication when specimens from eastern North America (from Québec) were added. One of these Québécois mushrooms grouped with the West-Coast North American collections--but another Québécois specimen formed a well-supported little group of its own with one Belgian specimen (while another Belgian specimen grouped with the rest of the European collections). Who knew?! The authors rightly conclude that "[t]o resolve these issues, further systematic taxonomic studies on C. tubaeformis are necessary."